Paradise Dreams Video Slot Guide & Review - Casino Answers! Paradise Dreams is a 5-reel, 20-line Real-Series Video Slot developed by Realtime Gaming, featuring wild substitutes, scatter wins, multipliers, a free spins feature, a bonus game and a progressive jackpot. You can play the Paradise Dreams video slot game at US-friendly online casinos Lucky Red Casino and Slotastic Casino. When you dream of paradise, do you think of tropical birds in all sorts of colours like green, yellow and blue, drinking from coconuts, bright-coloured flowers, islands with palm trees, tropical fish or maybe beautiful girls lying in hammocks? Well, it’s all here on the Paradise Dreams video slot! 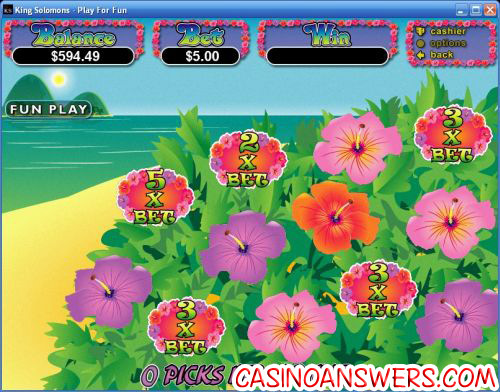 As you can see below, Paradise Dreams is a very bright and colourful video slot with almost a hippie-type look. Bets available on the Paradise Dreams slot game are: $0.01, $0.02, $0.03, $0.04, $0.05, $0.06, $0.07, $0.08, $0.09, $0.10, $0.25, $0.50, $1, $2.50 and $5 per line. This works out to total bets anywhere from $0.01 up to $100. To spin the reels and send yourself all the way to paradise, press the “Spin” button that is found in the lower-right hand corner. The Beautiful Girl symbol is the wild symbol in Paradise Dreams. She only appears on reels 1, 3 and 5 and substitutes for all other symbols except for the Scattered Island symbol to complete a winning combination. The wild symbol will double the prize when appearing in a winning combination. 4 Bird symbols plus a Girl wild symbol will win you the 5000 coin top jackpot in Paradise Dreams. If you don’t use the wild symbol to double your winnings, you will only receive a 2500 coin payout for 5 Bird symbols. Also, 4 Fish symbols coupled with a wild symbol will win you 2000 coins and the Flower and Coconut symbols with the Beautiful Girl symbol will win you 1000 coins. Paradise Dreams’ scatter symbol is the Island. All you need is two of these symbols anywhere on the reels to win a prize equal to your total bet. If you hit 5 Island scatter symbols, you can win 200X your total bet. Scatter wins are multiplied by the total bet. When three or more scatter symbols appear anywhere on the reels, you trigger either the free games feature or the Paradise Pick feature. If the free games feature is triggered, you will win 10 free spins with a 2X multiplier. During the free spins, any Butterfly symbols that appear will award you with a bonus prize of up to 10X the triggering bet. All winnings during free spins are doubled. Free spins are played at the lines and bet of the triggering spin. Paradise Dreams has a progressive jackpot, which is currently at nearly $2,800. The progressive jackpot is triggered at random, meaning there is no winning combination necessary and any spin you make can win. Progressive Jackpot wins are added to other game wins. Random Jackpot contribution is no more than 1.5% of the total Return to Player. You can win the Paradise Dreams Progressive Jackpot by playing Paradise Dreams at Lucky Red Casino! Hit the “Autoplay” button to open the autoplay settings. You will be able to set the number of spins, set it to stop when the jackpot is won, stop if a win exceeds or equals (any amount you input), stop on any win, stop if your balance increases/decreases by any amount you input and stop once the feature is triggered. You can deactivate autoplay using the “Stop Auto” button. Turbo Play can be found in the autoplay settings. Wins on different lines are added. Scatter wins are added to line wins. Scatter wins are multiplied by total bet. Line wins are multiplied by bet per line. Only the highest win on each line is paid out. The maximum win per paid spin is 50,000X bet per line. 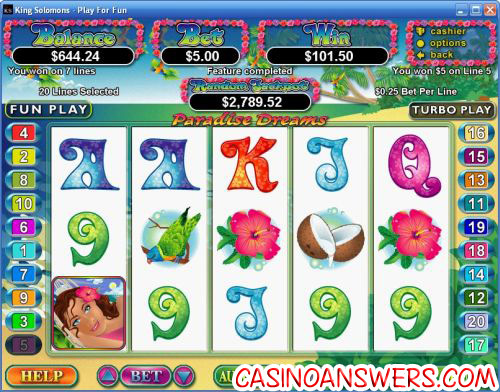 Paradise Dreams is another very good video slot from RTG. It looks stunning, offers multiple special features and gives the player the opportunity to win huge via the progressive jackpot. Get a 400% up to $4000 signup bonus to play Paradise Dreams now at Lucky Red Casino! If I’m from the United States, can I play Paradise Dreams for real money? Absolutely! You are welcome to sign up, deposit and play at most RTG casinos, which includes two of the best around, Lucky Red Casino and Slotastic Casino. How do I trigger the features on the Paradise Dreams slot machine? Both the free spins and bonus game features on Paradise Dreams are both triggered by hitting 3 scatter symbols. The slot game will select the feature automatically. Where can I play the Paradise Dreams Slot for free? Where can I find out more information about the Paradise Dreams Blog?